EnteraKt CLASS WITH ERIC DUNLAP: Learn how to work with Live Image Capture Technology from both the sides of the equation: that of the dance performer and the Video Jockey performer. 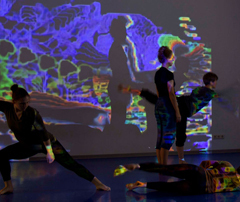 This workshop will include labs where students learn how to dance using a camera that imports their movement in real time using the Modul8 software program. This data is then manipulated live by the Video Jockey artist and then projected onto the performance space. Students will have an opportunity to choreograph and improvise movement as well as work as the Video Jockey. MODERN TECHNIQUE: Ms. Gibilisco teaches modern dance technique in the Nikolais/Louis Tradition and like her mentors, as a performance technique. Through her classes, Ms. Gibilisco explores the concepts of time, space, shape and motion to help students illuminate their intention and help them develop their performance quality. Ms. Gibilisco’s classes are also heavily influenced by her Pilates and Yoga training. All classes begin with an improvisation on the class theme followed by a floor barre where students develop their core strength, flexibility, control and upper body power. Proper alignment and understanding the biomechanics of dance are infused in every class. Upper level classes are designed to include exercises that develop partnering skills with emphasis on mounting and dismounting safely and quietly. IMPROVISATION: Ms. Gibilisco’s improvisation classes are influenced by her Nikolais/Louis mentors as well as her post-modern mentors: Douglas Dunn, Janet Lilly and Allyson Green. Morphing a traditional meditational approach of the modern dance era with a post-modern skill set, Ms. Gibilisco uses her history to inform the present process. COMPOSITION: Ms. Gibilisco draws on her years of study in composition and creative work with Murray Louis and her work with post-modern mentors: Janet Lilly and Simone Ferro. Ms. Gibilisco infuses Liz Lerman’s approach to developing feedback for choreographers which places her students “at the wheel” of discussion and analysis in an objective manner. Classes are often conducted as workshops where the dancers work on a problem either independently or in small groups. In cases where time permits, Ms. Gibilisco assigns class partners for the semester or term so that each dancer develops a strong relationship with another choreographer. Class partners function not only as supports to one another, but often as peer mentors and coaches. Partners often work outside of the class setting as well for consistency. Classes conclude with a showing by each choreographer and a feedback session. PILATES MAT: Ms. Gibilisco’s Pilates Mat classes cover a wide range of approaches. She has an extensive background in working with professional dancers and has worked with dancers from companies such as: Paul Taylor Dance Company, Merce Cunningham Dance Company, American Ballet Theatre, FOSSE, CHICAGO, MOVIN’ OUT and THE PRODUCERS. Ms. Gibilisco is also experienced in working with pre and post surgical candidates, pregnant women and clients living with diabetes. Her classes are theme oriented to suit the needs of the class and to better facilitate mastery of a particular concept or idea. Ms. Gibilisco is versed in using various different props in mat class including: magic circle, thera-bands, thera-ball and foam roller.